Jackson County, Mississippi – November 8, 2018 – WLOX reports that a twenty-one-year-old woman from Vancleave died in a head-on collision on Highway 57. The woman’s vehicle crossed the center line and struck a pickup truck that was moving in the opposite direction. The driver of the pickup was hurt in the crash and is expected to recover. A head-on crash occurs when the front end of a vehicle collides with the front end of a vehicle that is moving in the opposite direction. Head-on accidents are more common on roads where there is not a median, as a median often prevents cars from drifting into oncoming traffic. However, since there are many different types of median designs, the presence of a median does not prevent all head-on wrecks, and some do occur in areas where a median is present. Head-on crashes are not a common type of car accident, but they do cause many fatalities. The speed of the vehicles involved in a head-on collision is a significant determining factor in the severity of injuries that result from that crash. If one or both vehicles are traveling at high speed, the risk of death to the occupants of both vehicles increases. With the rise in distracted driving wrecks, there has been a rise in the occurrence of head-on crashes. Distracted driving is a major factor in head-on collisions, but it is not the only thing that can cause them. Alcohol and drug use, impaired driving, is the cause of many head-on collisions. 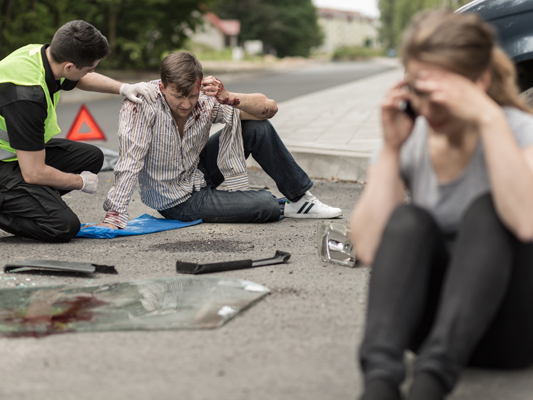 Medical emergencies like heart attacks or diabetic emergencies can cause head-on collisions, too. When weather conditions reduce visibility, the risk of a head-on crash goes up, especially on undivided roads. Drivers also increase the risk of a head-on collision when they pass in areas where passing is illegal, or when they break other traffic laws.